Now here is something that I would have wanted back in fourth grade: a Pac-Man watch. 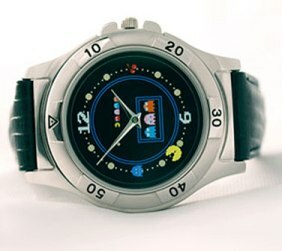 Granted, it’s not as cool as a Mickey Mouse Watch, but that’s only because Pac-Man didn’t have any hands. In all honesty, I don’t think that is what it is. It would appear that the hands are not digital, and the Pac-man is described as “an invisible second hand”. Too bad, because the LCD display watch with Pac-Man would have been cool.